Panelists representing California business, academia, art, and policy have a lively conversation about their roles in strengthening the fabric of U.S.–China relations. Nobel Prize-winning novelist Mo Yan talks about language, culture, and the creative art of translation. 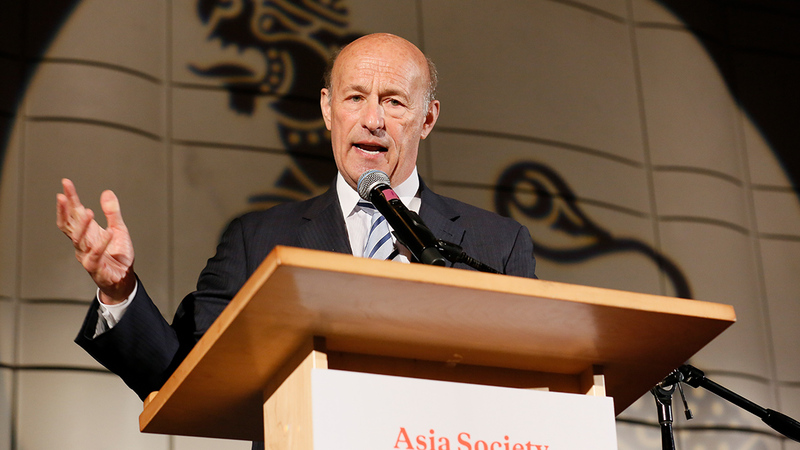 Australia's former Prime Minister, fluent in Mandarin, kicks off Asia Society's 2014 National Chinese Language Conference. Two renowned teachers share practical strategies for spiritual transformation inspired by Buddhist philosophy and Tibetan traditions. The Thai artist discusses ideas surrounding art and political agency, particularly with regard to his "Demonstrations" drawings. Curator of the 2015 Venice Biennale shares thoughts on the curator's role. Okwui Enwezor, Rirkrit Tiravanija, and Asia Society's Melissa Chiu look at current issues in international contemporary art. The journalist outlines some of the frustrations surrounding U.S. immigration policy that led him to make the film "Documented." Journalist and immigration reform activist Jose Antonio Vargas discusses issues raised by his film "Documented." Suzanne DiMaggio reviews history of nuclear negotiations for Texas Center audience. Abdul Basit, Pakistan High Commissioner to India, giving an address and then fielding questions from Shekhar Gupta, Editor-in-Chief of The Indian Express.